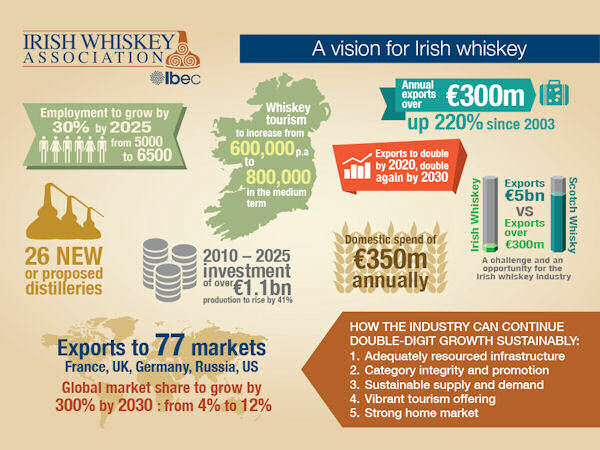 Tuesday 12th May 2015 - Minister Coveney will launch the Irish Whiskey Association’s “Vision for Irish Whiskey” at an event this evening in the Old Jameson Distillery, Smithfield. The document sets out the industry’s ambition for the future and outlines a strategy to ensure continued growth in the sector. There are 26 new or proposed distilleries across Ireland and annual exports of Irish Whiskey are now valued at over €300m, up 220% since 2003. Minister Coveney said: “Growth of almost 200% over a decade reflects an industry with ambition, a sense of mission and a deep understanding of individual markets. Irish whiskey brands now represent the fastest growing spirit globally and with investment of €1billion planned over a ten year period. Irish whiskey and those who champion it will be well placed to generate growth, exports and jobs and a very special tourist offering celebrating an all-island heritage.